1. Put the wild rice and vegetable stock in a saucepan and cook for 20 minutes until tender. Add the frozen broad beans and cook for a further 3 minutes, adding a little water if the pan seems dry, then drain through a sieve. 2. Halve the avocado, scoop one half into a small food processor and blend with the dressing, 2 tbsp water and a pinch of salt. Alternatively, mash the ingredients together in a small bowl. 3. 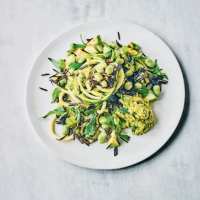 Heat the oil in a frying pan and fry the courgette spaghetti for 2 minutes. Stir in the garlic, cumin and tarragon leaves and turn into a bowl. Dice the remaining avocado and add to the bowl with the wild rice, beans and transfer to plates and serve with the piri piri avocado dip on the side. This recipe was first published in Thu Aug 02 11:53:19 BST 2018.